PHOTO GALLERY - WINDFARM PROPOSAL - YARRAM AND DISTRICT, South Gippsland, Victoria. 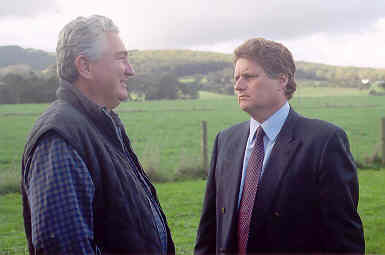 SOUTH GIPPSLAND Back to Windfarm Home Page. 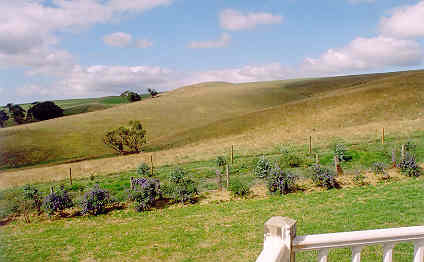 AusWEA guidelines indicate that wind energy companies should prepare montages of photographs from several aspects, with the wind turbine towers shown in situ. On several occasions Synergy Wind Pty Ltd have been requested to provide such montages. Neither I, nor any Devon North resident of my knowledge, haveseen any such montages prior to the Permit Application bing submitted in July 2006 to the Wellington Shire. Photomontages of the proposed wind farm will be submitted as part of the development application. The photomontages will be available through the Council once the development application has been lodged. If you require another 30 or 40 photomontages for private use I could give you contact details of the consulting company we used for the visual studies. 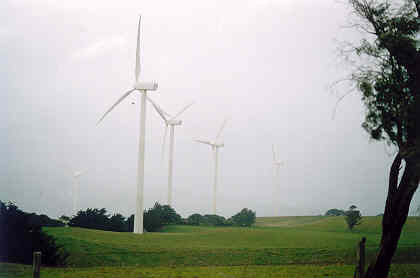 On 4 July 2006, Wellington Council released the Permit Appication presented by Synergy Wind for nine turbines on the property seen in the photo immediately below. With this application were two montages, one taken from Bolgers Road, another from Ingles Road. The quality of the images are so bad that they are not worth reproducing here. 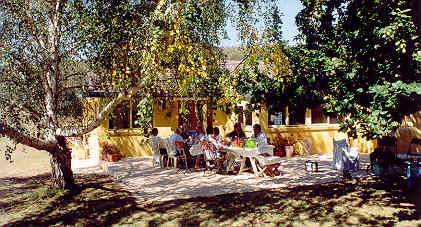 No photo montages were created from the aspect of any neighbouring property. 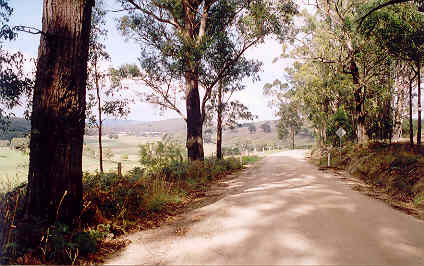 This is the view from Ingles Road as you drive down from the bush into the valley. The nine wind turbines will be located on the hill.The nearest 80 m wind turbine tower is expected to be within 500 metres of the residence seen on the left. 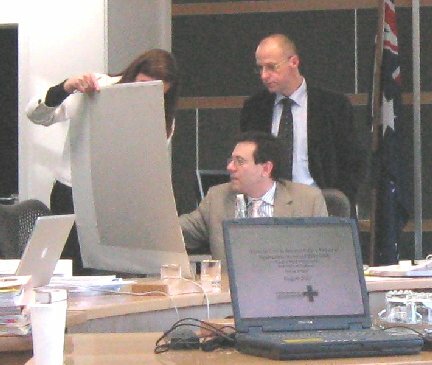 PHOTOGRAPHS TAKEN AT THE VCAT HEARING IN SALE, VICTORIA, 1 AUGUST 2007. 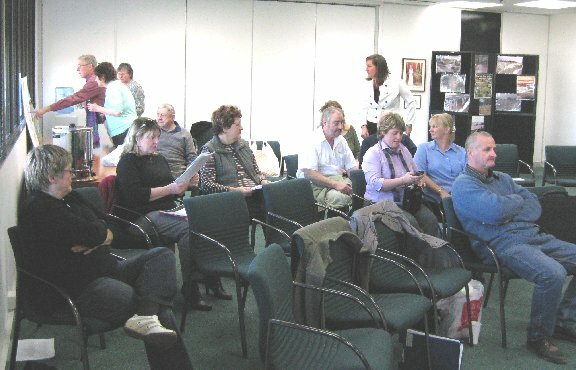 Above: Some of the memmbers of the Concerned Residents of Devon North coalition who attended the VCAT hearing at the Wellington Shire offices in Sale, 1-3 August 2007. Right: Tom Reakes points out a feature on the excellent to-scale three-dimensional model constructed by Pauline Kimber (far right). The model shows the land of the proposed windfarm, with model windturbines in place, and the surrounding landscape with resident houses marked, and land use indicated such as state and pine forest. Below, left and right. 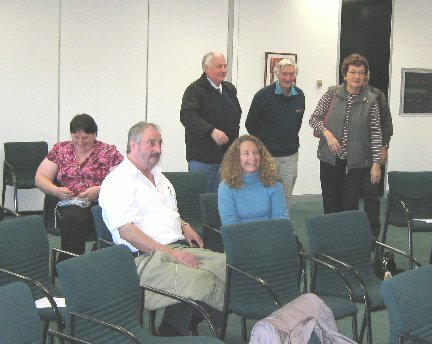 Members of the CRDN wait in the gallery for the commencement of procedings on the first day of the VCAT hearing. 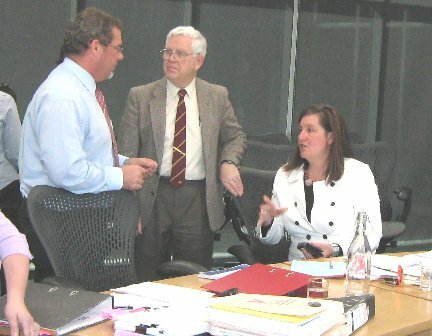 Below: Mr Patrick O'Neill and Mr Graeme Harding speak with barrister Joanne Lardner, who is representing the CRDN coalition. Mr O'Neill is a geologist called as an Expert Witness by Ms Lardner. Mr Harding is an acoustic engineer also called by Ms Lardner. Right: Mr Paul Chiappi (seated) representing Synergy Wind, and Mr Christian Spitzner, Project Manager at Synergy Wind. CAN'T SEE THE WINDFARM? RUBBISH!! 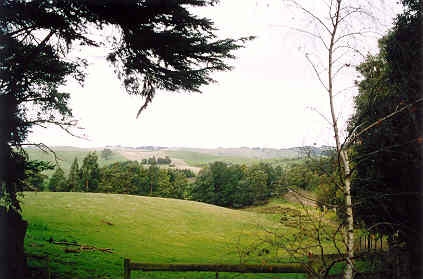 In their permit application to the Wellington Shire, Synergy Wind Pty Ltd included a table indicating that the Stone/Bouker property, seen on the left in the photo immediately above, would not see the windfarm. (Likewise a similar comment for several other properties). 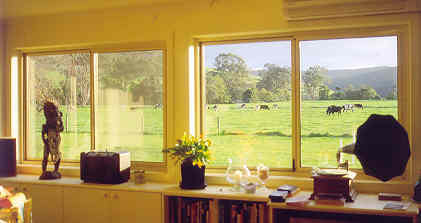 On the right is a photo taken from the Stone/Bouker family-room, looking north-west. It is obvious, particularly from the photo below left, that the 120 metre wind turbines will be clearly seen from the residence, which has over 20 metres of windows facing west, north-west and north. 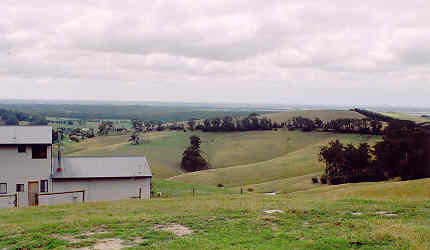 The photo bottom right is taken from the edge of the north verandah and clearly shows the hill where the nine turbines are to be built. The extension to the house was built several years ago to take advantage of the view. Note there are no curtains or blinds. The delightful view is ever present when in the family room, dining room and kitchen, and changes during the day with the rise and set of the sun. Federal Minister Hon. 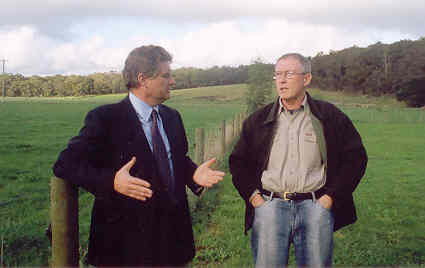 Peter McGauran, visited the Stone/Bouker property at Ingles Road, Devon North in June 2006, to visualise the impact of the windfarm on neighbouring properties. Right: The Minister takes a great mark - and kicked a few goals with his condemnation of windfarms for their intrusion into the community and their need for government subsidy to exist. The proposed windfarm site is on the hill rising to the left of the image. Below: With Bolgers Road resident, Tom Reakes. Below right: With Bolgers Rod resident Tad Heibert, who will be the closest to any of the nine 130 metre wind turbines - about 320 metres. 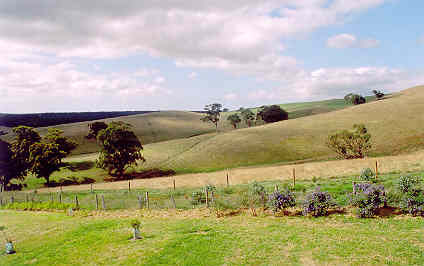 A view toward 'the hill' of the proposed wind turbines, from the residence at Ingles Road. Noise and flicker is expected to be a major concern. This property is home to a family of three who enjoy th outdoor living and bought the property bcause of its delightful rutral aspect and quiet living. The owners have spent near $100,000 on renovations. 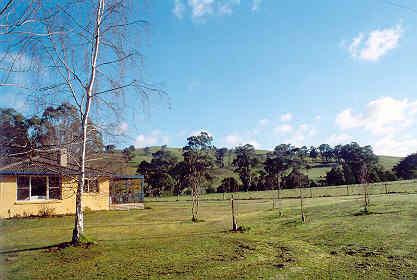 A view toward 'the hill' from the balcony (see in photo left) of the residence on Ingles Road. Eighty metre wind turbines will line the top of the hill. Legislation should be enacted to ensure that wind turbine towers are not erected within at least two kilometres from a neighbouring residence. It need not all be doom and glooom! 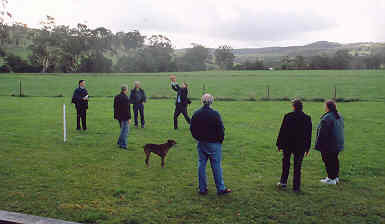 Concerned residents of Devon North have a convivial bar-be-que at the Ingles Road residence prior to a meeting to discuss issues and strategies regarding the proposed windfarm on the neighbouring Helleren property. The ambience is quiet and pleasant at present, but with nine turbines from within 500 metres to 1000 metres, this will no doubt change. Residents have the right to quiet and peaceful enjoyment of their homes, and no neighbour should have the opportunity to interfere with such a right. And yet this appears to matter little to those proposing to erect wind turbines, and seems to have slipped by the considerations of state government. It is up to local council to ensure that their residents and ratepayers are not disadvantged. 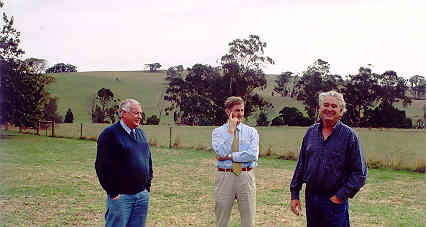 Peter Ryan, (centre), State Member for Gippsland South and Leader of the National Party contemplates the concerns expressed by neighbouring residents to the construction of a windfarm on the hill in the background, seen here from the Ingles Road residence. Ian Stewart and Tad Heibert, both of whom own properties on Bolgers Road, are also very much concerned. Peter Ryan stated, "In ten years time, we will look back at the folly of wind turbines and see them as testiment to man's stupidity". He is working actively to ensure the appropriate placement of windfarms in rural areas, where residents are not disadvantaged, as they will be in the case if the Devon North windfarm goes ahead. Tad and Elizabeth Heibert are like any hard working people who look forward to a quiet and enjoyable retirement. This charming couple searched for their little bit of paradise and found Devon North. They purchased a small acreage with exceptional views, and built a delightful home with huge windows and a wide verandah to take advantage of the outstanding view and to enjoy outdoor living. Their dream has been shattered by their neighbour's proposal to erect nine 80-metre wind turbine towers right in front of their home, the first tower within 400 metres. The neighbour have now planted a one hundred metre long double line of blue gums, so that the turbines would not be visible. This has made the situation even more intolerable. The view will be totally destroyed as the trees grow. How can these things happen in a sensible and careing community?? It gets back to financial advantage - to some, at the expense of others. Tad and Elizabeth's home has been legally devaluted by $100,000 as a result of the proposed windfarm. This is a big enough concern on its own - then there is the visual intrusion, noise, flicker, disruption. Anna Jung tries to block out the image of what her view will be like when nine 80-metre white towers line the hill less than two kilometres from her home. She and husband Rudi will be able to see all nine turbines. 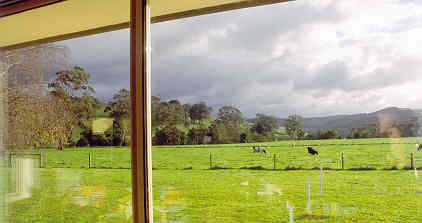 They moved from Yarram and built their home to take advantage of the wonderful views of these South Gippsland hills. On most days she can see Wilsons Promontory, and on a clear day, she can see the Kent Group in eastern Bass Strait. The intrusion of the wind towers, which will rise some 120 metres to the tip of their monstrous blades, will totally distract from her view. What right has any neighbour, council or government to deny her this view. The proposed Devon North windfarm, or 'Wind Park' as Synergy Wind's project manager Christian Spitzner prefers to call it, is located within a rural-residential area just ten minutes from Yarram township. The neighbouring properties are predominantly residential only, built to take advantage of the tranquility of rural living. The families range from retirees to working folk with children, all anxious to enjoy their life and raise their children in what is a most delightful environment. They do not need the hassles and worry of property values, noise, flicker, electromagnetic interference, andconstruction noise. They just want to ensure a stable existence without any unreasonable commercial intrusion into their life. The grief is not with wind energy - it is where the turbines are placed. And a rural-residential area is not a suitable location.In the above photograph, the nine turbine towers will be on the high hill to right of centre. Yarram township ca, at the moment, be seen beyond the hill. To the right, out of the photo, can be seen Port Albert, the islands of Bass Strait, and Wilsons Promontory. Who on earth thinks it reasonable to mess with this view!!! 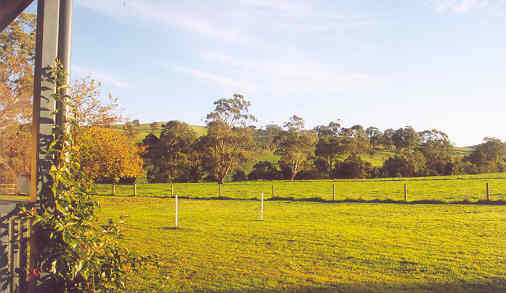 This suberb property is located near Five Ways, at the corner of Bolgers Road and Old Whitelaws track, and is due east of the location of the poposed nine wind turbines, along the hill centre background. Their main concern may well be flicker, as the sun sets behind the revolving turbine blades. The predominant winds comes from the east and south-east so noise could also be a factor. The view here is magnificent. Although hard to see in the photo, the Jung home (see above) is just visible to the far right of the image, just below the high ridge. This is Bolgers Road, just west of Five Ways, heading toward the proposed wind farm property which can be seen through the trees at the top of the road, (to the right). It is this narrow gravel road, with a steep drop-off to the south (left in photo) that Synergy Wind Pty Ltd plan to run cement trucks and huge low loaders in order to construct the 'wind park' on the Helleren property. Any other business interest proposing to construct a commercial entity would, more than likely, not get past council. The road is winding, steep in parts, has an unprotected drop-off, loose surface, overhanging trees, trunks close to the road edge, and blind corners - and a bridge - all amounting to being a rather dangerous road at the best of times, let alone with cement tracks and low-loaders. And Ingles Road is even worse. "Not Happy". You bet they aren't. 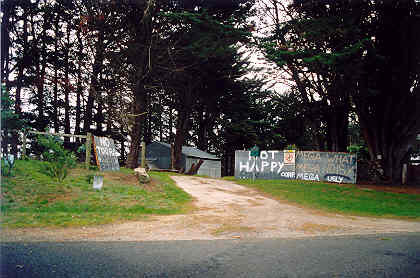 This is the entrance to a property at Toora. Walk forty yards to the left of the gate and you have the image at right - a row of seventy metre turbines right in their backyard. No wonder the family is not happy. "Mega What! Mega Noisy". I believe the owners have moved out. And interestingly, it appears that of seven owners of propertis on which a wind tower has been constructed at Toora, two have already moved off their property. Not sure of the specific reasons, but 'noise and disruption' was quoted. There are five turbines here in just this one patch, all witihn 600 metres of the residence. You can't see them in this photo, but there are some ten seventy-metre wind turbines on the crest of the hill in the distance. (The towers are white hence being invisible in the photo, taken on a particularly dull day). The hill is two kilometres distant. 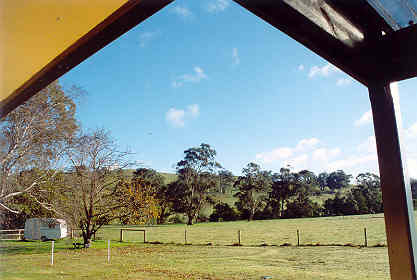 The photo is taken from in front of the bedroom window of a residence. Repeat - the turbines are two kilometres away. Yet on some days, the residents cannot have a quiet bar-be-que outside without having the radio on - to drown out the turbine noise. But thats not all. The sun rises right behind the turbines, and the house is 'bathed' in flicker, sufficient to wake up the residents if they fail to close their curtains. And indeed, why should they have to close the curtians when they have such a delighful view? They didn't have to do it before the turbins intruded into their lifestyl. If noise and flicker are not a problem, as touted by Synergy Wind, then perhaps they need to have a talk with the very people who are affected (in this instance, caused by another wind farm company).